Do you remember when you were a child, your mom or dad would say, “Don’t sit too close to the television; it’s bad for your eyes.” Or maybe they said, “Turn off that television and go outside and play.” They were definitely on to something…something that could potentially save your life. I’m talking about the health effects of watching TV. In a recent study, kindergartners in the United States who watched at least one hour of television a day had a greater chance of becoming overweight, compared to the children who watched less than an hour of television a day. The study, which analyzed children who attended school during the 2011 and 2012 school year, concluded that lifestyle factors also played an essential role in a child’s educational performance. The list included many factors, including the number of hours the child spends in front of the television a week. The results from the study illustrated that kindergartners living in the U.S. watched an average of 3.3 hours of television a day. It also showed that kindergartners and even first-graders who watched one to two hours of television a day or even more than two hours a day had a higher body mass than the children who would watch 30 minutes or less of television. A study that was done on people with a higher risk of being diagnosed with diabetes found that every hour spent sitting down can actually increase the chances of developing the condition by 3.4%. If you’re sitting around all day, that percentage can jump to about 30%! 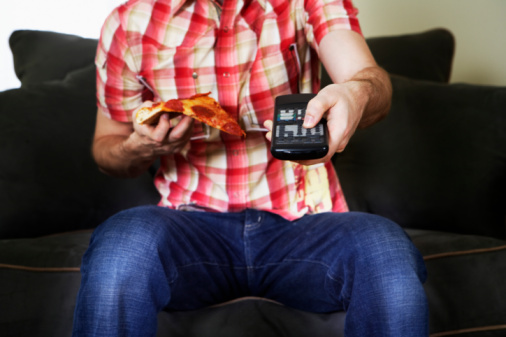 I’m going to repeat that: sitting down watching TV all day can up your chances of developing diabetes to 30%. And, because of the new development of being able to stream television shows now, a person can literally watch an entire season of a show in one day if they choose to. A half-hour show can turn into a 24-hour binge watch, so this percentage can go even higher than 30%. Another risk of watching too much television discovered in a study published in the International Journal of Cardiology was developing high blood pressure, especially in children. The study elaborated that children of 2 to 10 years of age who spend a significant amount of time in front of the television had a 30% higher risk of having high blood pressure than the children who did not spend a large amount in front of the television. If the child did not take part in any physical activities at other times, the 30% risk jumped up to 50%. The data from this study is based on 5,221 children from eight European countries within a two-year span. In addition, high blood pressure can actually lead to cardiovascular problems in the future. One example is ischemic heart disease; high blood pressure can actually trigger this type of heart disease. Other research has also suggested that excessive television watching is almost as dangerous as smoking or even being overweight, and should be brought to the attention of the public as a real health hazard. In fact, experts out of the University of Queensland, Australia, stated that each hour of television you view can actually shorten your life by 22 minutes. To back up that statistic, one survey conducted compared the life expectancies of adults who watched significant amounts of television and those who did not, showing that people who watched significant amounts of television shortened their respective lives by 21.8 minutes. A more interesting statistic from the same survey was that those who watched at least six hours of television a day should expect to live 4.8 years less than a person who does not. Slashing the amount of television you watch a day can be very beneficial to your health. Limiting the amount of television they watch a day is a great way to keep a child’s weight under control or even help them lose weight. If a child develops a weight problem at an early age, it’s only going to get harder to resolve it as they get older. Not to mention the health issues the child can develop as they grow, such as obesity or even diabetes if they continue with their routine. In addition, you can actually improve a child’s diet by scrapping significant amounts of television. Children who get home from school and sit in front of the television tend to consume high-sugar candies and beverages and are less prone to eating veggies and fruits. From a family standpoint, limiting television can actually improve fertility for a couple. Studies have shown that men who watch on average a total of 20 hours of television a week had a 44% decrease in sperm. Do not panic, though, if you’re in that category; just turn off the television and start participating in some activities. In addition to healthy fertility, your marriage could benefit from less television. Because of the many soap operas on the tube, you or your spouse may compare your actual marriage to the fictional ones on television, which really sets the bar high. In many cases, this can lead to one or both partners being unhappy with the relationship. So, want to live longer and be healthier and happier? Turn off the television. A study that was published by the Journal of the American Medical Association showed that for every three hours of television watched, the risk of death by any cause increased by 13%. If you also value your sleep, turn off the television. Another study showed that 50% of Americans stated that two hours before they go to bed, they watch television. Most of us are not getting enough sleep, so instead of watching your shows, just go right to bed and tack on those extra two hours of sleep. Probably the most important reason to stop watching television is that it can damage your heart in the long run. Research has shown that for every two hours a person was found in front of the television, the risk of a heart disease increased by 15%. Of course, you can’t just replace television-watching with another sedentary activity, like surfing the Internet or playing video or Internet/smartphone games. That won’t solve the problem. As much as you may love your Game of Thrones, Scandal, or Dancing with the Stars, they don’t care if you live or die; they only care about ratings. Do yourself a huge, possibly life-saving favor and turn off the television. Your body needs you to take care of it and, by just sitting around, you’re literally letting it waste away. I’m not saying you have to go cold turkey; just limit your TV time to a short period during the week. Instead of vegging out for hours every evening, get up and move around; even better, get outside! And, when you do watch TV, consider doing it while on a treadmill or while doing some stretches or even yoga. Finally, if you’re watching TV for more than half an hour at a time, make sure you get up for breaks. Just walk around the house or do some stretches. Park, A., “This Is What Binge Watching TV Does to Your Health,” April 1, 2015, Time web site; http://time.com/3767458/tv-binge-watching-health/. “Just an hour of TV a day linked to unhealthy weight in kindergartners,” April 26, 2105, Science Daily web site; http://www.sciencedaily.com/releases/2015/04/150426110453.htm. Beckford, M., “Every hour of TV watching shortens life by 22 minutes,” August 15, 2011, The Telegraph web site; http://www.telegraph.co.uk/news/health/news/8702101/Every-hour-of-TV-watching-shortens-life-by-22-minutes.html. “Children who watch TV for more than two hours a day ‘at greater risk of high blood pressure,’” February 25, 2015, The Telegraph web site; http://www.telegraph.co.uk/news/science/science-news/11435628/Children-who-watch-TV-for-more-than-two-hours-a-day-at-greater-risk-of-high-blood-pressure.html. “TV Health Problems: Why You Should Turn It Off,” July 2, 2013, Huffington Post web site; http://www.huffingtonpost.com/2013/02/07/tv-health-problems_n_2631357.html?ir=India&adsSiteOverride=in.